LOMA LINDA, Calif. --- Hundreds of enraged students and faculty of the Loma Linda University School of Dentistry have started a Change.org petition to impeach US Vice President Joe Biden. 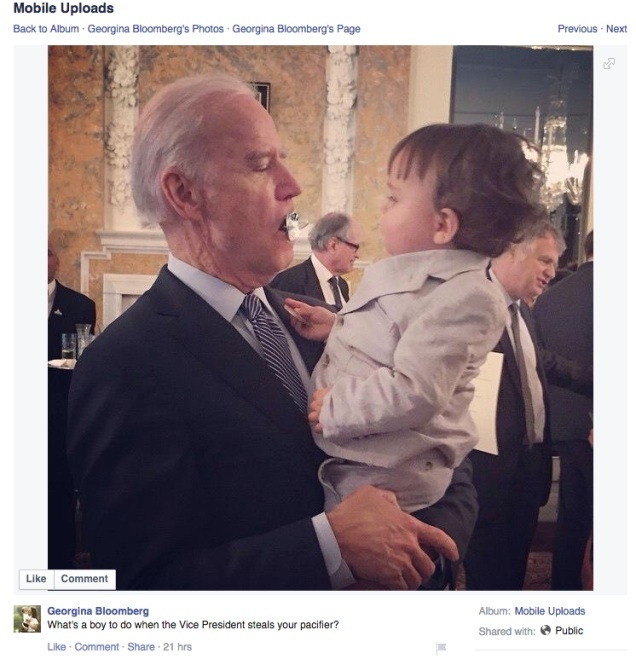 The group claims that a recent photo showing Biden with a pacifier in his mouth, holding a baby, portrays "disgraceful disregard for basic hygiene and responsible baby handling at the very highest levels of government." The picture in question was taken of Biden at a Washington ceremony this week. The baby is the grandson of former New York City Major Michael Bloomberg who was being honored at the event. "None of us should forget that the man who very clearly stole a defenseless baby's pacifier and grotesquely popped it in his own mouth is a mere heartbeat away from being the most powerful person on the planet," said dentistry student Max Blancness. "We, at the LLU School of Dentistry, are taking a stand against such unhygienic irresponsibility." The group claims that according to the United States constitution a Vice President can be impeached for "high crimes and misdemeanors" and that "stealing from babies and exhibiting horrible oral hygiene" are prime examples of such failures. Others on the Loma Linda University campus are less convinced. "This is clearly just the whole 'wannabe doctor' complex rearing its ugly head again," said third-year medical student Fred Heeler. "The dent students are always out to prove themselves in one way or another. The only thing that's clear from this is that dent students have way too much free time." LLU Chaplain Bradley Carley said that the impeachment petition was a prime example of misplaced Adventist energy. "As Adventists we've really got to learn to pick our political battles. This is a complete waste of time. Besides, if Biden goes, so do half the jokes about Washington." Clever, sevvy. To me the funniest part was listing “stealing from babies and exhibiting horrible oral hygiene” as “high crimes and misdemeanors” under the Constitution.